ArtTrader Magazine: ArtTrader Mag is BACK IN ACTION! We're pleased to announce that after taking a much needed break during 2013, the ArtTrader Mag team is back together and will be resuming our quarterly zine starting January 1, 2014. Woo! We're excited! 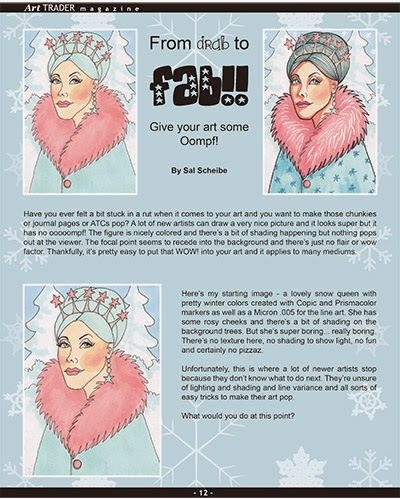 We have great "how to" articles for Issue 21 as well as our regular columns and artist features. 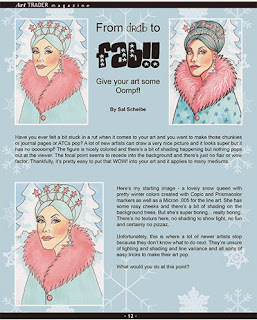 See a page for the upcoming issue at left: From drab to FAB! We also have a new feature for each issue - freebies! We'll include a couple of free items like digital collage sheets or art doll templates with each quarterly release. You can find these new items in the Freebies! section of the ArtTrader website. Don't forget to sign up for our mailing list. We'll be sending it out only 4 times per year - each time we release a new magazine so you never miss one.